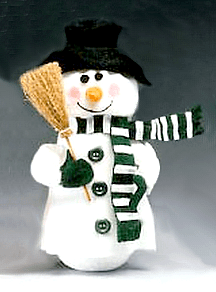 Snowman Wobbler – wobbles but he won’t fall down. Who can resist giving this adorable snowman a little prod in the belly button – just to see him wobble. There’s a free pattern to download, and all the instructions you need to make a snowman wobbler for yourself or as unique homemade Christmas present. 1. Press opposite sides of foam ball on a hard surface to flatten slightly. Wax serrated knife with candle stub or paraffin and cut ball in half. 2. Refer to diagram to cut top 4″ from foam cone. Mark a line around cone 5″ from base. Indent cone on line by pressing foam onto square edge of a counter or table. Note: This will become snowman’s neck. 3. Refer to diagram to hollow out lower 5″ of cone and one half ball by scooping out foam with a tablespoon. Leave approx. 1/4″-1/2″ outer shell intact, working carefully to avoid cracking foam. 4. Cut white chenille stem in half. Using pattern, cut two mittens from dark green felt. Glue mittens to matching felt, sandwiching a white chenille stem between layers. Let dry. Cut mittens from doubled felt, cutting around original shapes. 5. Cut out remaining snowman patterns as indicated. Also cut one 12″ x 4″ strip from white felt for head and one 8″ x 3/4″ strip from dark green felt for neck portion of scarf. 6. Wrap orange chenille stem around tip of needlenose pliers to form cone nose. Mark placement of nose on center of 12″ x 4″ white felt head; do not glue. Paint pink round cheeks on either side of nose mark. Draw a curved smile with black dimensional paint between cheeks. Allow to dry. 7. Fringe ends of scarf tails as indicated on pattern. Glue a green chenille stem lengthwise to back of each scarf tail just above fringe and then trim the excess stem. Cut 1/4″ wide strips from excess white felt. Glue strips approximately 1/2″ apart to both scarf tails and the 8″ x 3/4″ neck strip, trimming them flush with edges of dark green felt. 8. Overlap one side of felt robes 1/4″ and glue to form one long piece. Glue buttons to robe where felt overlaps (see photo). 9. Following patterns, overlap corresponding edges of robe, hat crown, and sleeves 1/4″ and glue to form tubes. Repeat for head with facial features to inside. Turn. 10. Insert a chenille stem arm into each sleeve with wide end overlapping mitten slightly. Gather each sleeve 1/2″ from bottom. To gather fabric throughout, use a large-eye needle with fine-gauge wire and hand sew gathering stitches where indicated. Gather fabric on wire and then twist wires together to secure. Trim excess wire. Spot glue bottom of sleeves to mittens, if necessary. Repeat to gather sleeves around chenille stem arms 1/4″ from top. 11. Place robe on cone with top of felt 1/4″ above indented neck. Gather robe around neck. Place head on cone with bottom of felt overlapping top of robe and face centered above buttons. Gather head around neck. Stuff head with fiberfill between foam and felt to give it a round appearance. Gather head 1/4″ from top around cone. 12. Glue cone nose to face with two black pom pom eyes centered above. Glue 8″ x 3/4″ striped neck strip around neck, overlapping ends at one side. Glue one end of each scarf tail to neck strip, concealing side seam. Shape soft ripples in scarf (see photo). 13. Gather hat crown tube 1/4″ from top edge. Turn and shape as desired. Place hat brim over top of head, enlarging center circle if necessary. Place hat crown on top, gluing bottom edges to brim. Glue hatband around base of crown with ends at center back. 14. Use an awl or ice pick to form tiny holes in robe and foam body at shoulders to attach arms. Glue arms into holes with sleeve seams concealed at bottom. Glue broom tucked behind a mitten (see photo). 15. Turn cone body on end and weight hollow area with glass marbles. Align hollow half ball on bottom of cone with flat sides together and pin in place temporarily. Test snowman’s rocking motion, adding or subtracting marbles as necessary. When satisfied, remove pins and glue ball to cone permanently. Project reprinted courtesy of The Dow Chemical Company, Manufacturer of Genuine STYROFOAM® Brand Foam.